In the war against cancer, molecular biomarkers hold out tantalizing promise. Johns Hopkins researchers are leading the charge. When the Indian Ocean tsunami hit South Asia, the Johns Hopkins community responded in full force — with donations, expertise, and assistance. 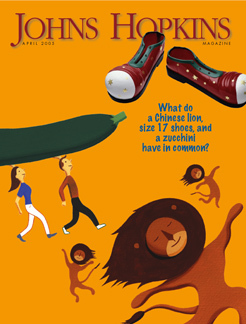 What do a Chinese lion, size 17 shoes, and a zucchini have in common? They're all part of our A to Z guide to Johns Hopkins volunteering. Crossing the Thai border into Burma, the "backpack medics" risk their lives to provide health care to the besieged Karen. Maryland Lieutenant Governor Michael Steele, A&S '81, didn't get his Republican values from the Republican party. He got them from Mom.